We went car camping again this weekend and this time we’re committed campers. You can tell because we bought our tent in advance instead of renting one. 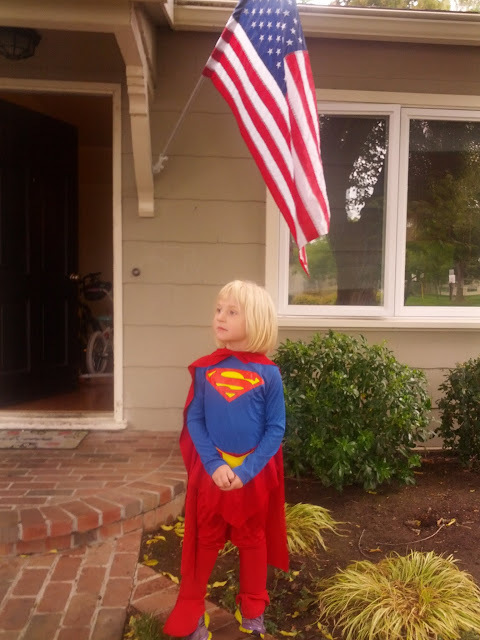 We didn’t have anything to worry about because we brought our own little Clark Kent along with us, fighting for truth justice and the American way. (OK that picture has nothing to do with our camping trip but it was too cute to ignore. At camp, Leo’s day camp, a couple weeks ago Leo had dress up day and there is no way Lucy would just let Leo dress up and not dress up herself). Now back to camping. Here is how the day went. I got up and ran a half marathon on some trails in Castro Valley. When the race was over my family came and met me at the Lake Chabot marina. We would camp up in the hills at night. The marina is nice park next to the lake where you can rent canoes and pontoons and have barbeques. Leo found some friends including a girl that he was pretty smitten with who he followed around and picked blackberries with. Caleb and I estimated her to be about 8 years old. She called Leo “macaroni and cheese boy”. This is conversation I overheard. Leo: Why do you call me that? My name is Leo. Older girl: Do you want me to call you macaroni and cheese or Leo? This girl gave us directions to see some turtles. Walk in that direction until you come to a tree on a grassy hill, at that point go the the lake and there will be turtles on a log. Being in a park of grassy hills with trees on them even though the directions were quite specific it was not obvious how to find the turtles. But we did. Here are Caleb and Lucy looking at them. Our same camping buddies, Yvette, David, and Bea joined us as well over at our campground. 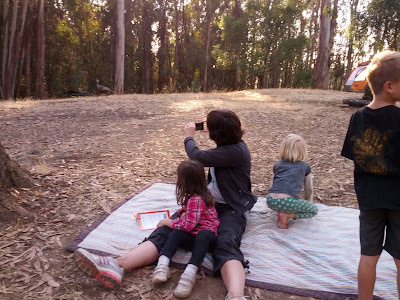 Lake Chabot in Castro Valley gets some negative reviews on yelp as being too urban for camping. But if you are gonna camp 40 minutes from home it is pretty great. Some of the sites (not ours) have a beautiful view of the lake (which is really a reservoir) about 700 feet below. 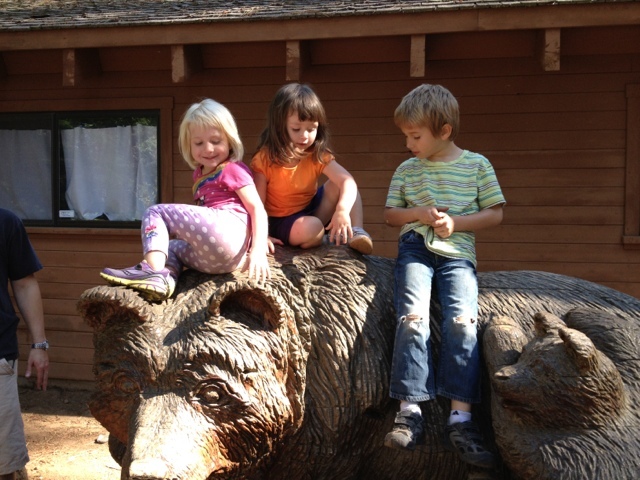 Our site was nestled in eucalyptus trees and was a fun place for the kids to play ball. We took a hike down to the late and it was a stunning view. I had hoped to get some family pics with the lake in the background but the sun didn’t really work out. Here are the Hattons. who do appear to be much more photogenic than my family. 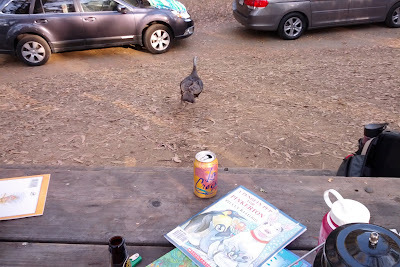 When a turkey wandered right through our site! Turkey’s turn out to be the bears of Castro Valley, e.g. the pests that will eat all your food at night. Fortunately, you do not have to worry that a turkey will come and gobble up your child. In our case, a turkey, (at least we suspect it was a turkey), came and gobbled up Yvette’s picnic basket while we were sleeping at night. 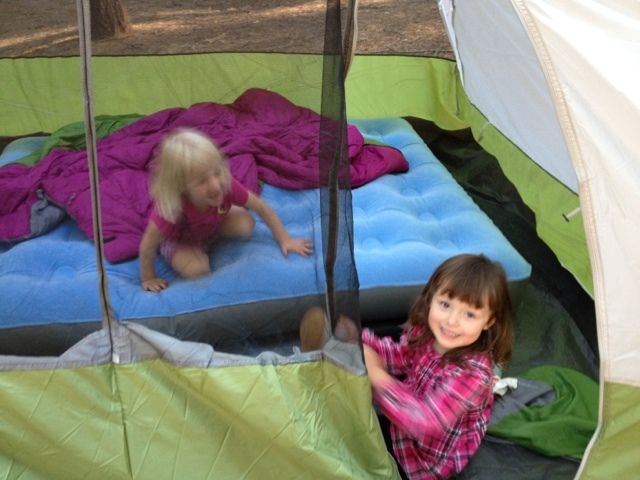 The final part of this camping story is about the nighttime of us, now pro, campers. We were walking around before bed and Caleb and I were looking around the campground and most sites had their rain fly’s on. We were wondering, “what’s wrong with those people, don’t they want to see the stars?” Then in the middle of the night Leo woke us up because he had to pee. And we heard raindrops. And it was raining. So who was laughing now? So Caleb went to the car and got our rain fly and figured out how to put it on in the middle of the night. This was quite a feat. But then when we woke up in the morning it appeared to not have rained at all! So who really knows what happened in the middle of the night that caused all this work and confusion. Mist? We were all pretty tired by the time we got home. I would say tired and hungry because those words go together. But we were not as hungry as our pets who we had not fed as of yet. Here is Daisy eating her first mouse on our watch. Yum. for Oliver and Daisy. Or so Leo says. Which brings me to one of my first marital challenges. Usually Caleb and I can agree when it comes to raising our kids, but when it comes to raising snakes, I’m not so sure. Caleb thinks we should feed Daisy tomorrow (Thursday) because Lady snakes need to eat a little more than men snakes. I think we should should just feed them every Sunday like clockwork and not add any complications that we can screw up. Caleb thinks he knows more than me because he has been reading books about corn snakes. I think I know enough because I read the 1-page care manual that we got when we bought them. Will we work it out? The snakes continue to be a lot of fun. Daisy seemed a bit more lethargic than Oliver. I was wondering if it was a personality trait but then her skin fell off and now she is quite active as well. Caleb left me the skin on the kitchen counter to make sure I got to see it as well. Here it is right with the root beer. I was really worried that Maria, our nanny, would be really grossed out by the snakes. She doesn’t love them but she has not quit yet. I also dont think that she knows when she put her plums in the fridge tonight she was putting them in the container we brought the snakes home in. Yuck. On our way home camping we saw some signs on the side of the road that said “Reptile Show, Santa Clara Fairgrounds.” You loyal readers must remember how much Lucy loved reptiles as a baby. So we decided that a reptile show might be a pretty fun thing to go to. The Santa Clara Fairgrounds proved to be a side of Silicon Valley that we were not familiar with. Upon entering, first we passed the building with the gun show. Then the next building had the reptile show. Off in the distance behind the parking lot we could see a motor cycle area where bikes were jumping off little hills and flying though the air. It was pretty cool. At the reptile show we saw more reptiles than I ever have in one place. And snakes. Lots of snakes everywhere. 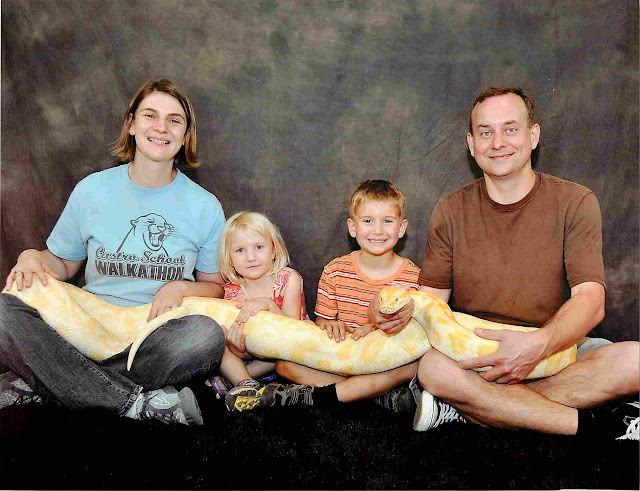 We got a family picture taken with a huge burmese python. Well actually it was small for a burmese python but also the largest snake I have ever seen. I dont know many feet long, maybe 8ish feet, and 70 pounds. But it turns out these snakes get up to 19 feet long and 200+ pounds. Now comes the learning section of today’s blog. Apparently, these huge snakes have become pests in the Florida Everglades and are eating all the wildlife. There are two theories I’ve read about in the past few minutes. One is that pet owners get sick of having to buy whole chicken’s every week to feed these monsters and therefore have let them into the wild. Another theory is that a breeding center was destroyed during Hurricane Katrina and a large number of snakes have gotten loose. Anyway, it is having a big impact on the Everglades wildlife and many endangered species are being eaten right up left and right. Sometime during the show Leo started asking for a pet snake. And at some point Caleb and I started thinking that was a fun idea. And then at some point Caleb and I decided that two snakes were better than one snake. And if you are gonna get two snakes why not get a breeding mommy and daddy? And so now, we have our first two family pets, also a mommy and daddy, two corn snakes. The kids have named them Oliver and Daisy. We are all pretty excited. As we were leaving the fairgrounds to go home and I was giving Lucy a shoulder ride, Lucy announced she had to go pee. “Can you hold it, Lucy?” “No, I’m about to pee on you.” That was enough motivation for me to head over to the gun show to see if I could use the bathroom. On my way over a friendly man with flyers asked me if I was in the NRA. I said “No.” “Would your daughter at least like a coloring book?” A NRA coloring book. Uh no thank you. Lucy and kept smiling and made it to the bathroom and back with no impulse gun purchases and no gun coloring books. Phew. Here is Leo and Oliver. Leo says it was the best day ever. That is because he was riding his bike for the first time and wasn’t scared. Leo was just struck with a bunch of confidence today. Maybe because his dad got him a new helmet this week. Maybe because he grew since he was last on the bike. But today he just jumped on and rode and rode. I am really proud and excited for when all of us can ride as a family. Caleb and I were so excited that we went out and bought Lucy a bike. She isn’t quite ready to ride but she’ll get there. In fact when we first got to the park Lucy jumped off her new bike to pick up the burger king crown she saw on the ground. Sometimes the trash in the park is more exciting than a new bike. We spent yesterday in the park too. Here is Leo on the cement slide. And Lucy doing push-ups in the mud. 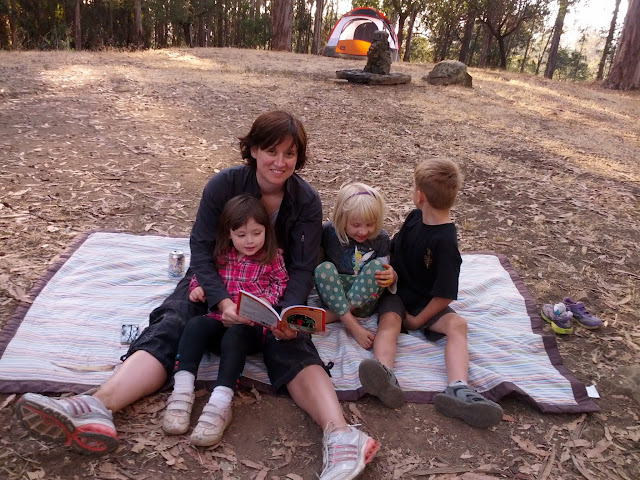 Last weekend we went car camping with Yvette, David, and Beatrix. When Caleb was a boy he used to go backpacking with his dad. So what I have always called “camping” Caleb calls “car camping”. “Car” is a semi derogatory adjective but also an essential one when your kids are not old enough to carry a backpack into the wilderness. But really this post could be called “car mishaps and camping” because camping started and ended with a car mishap. 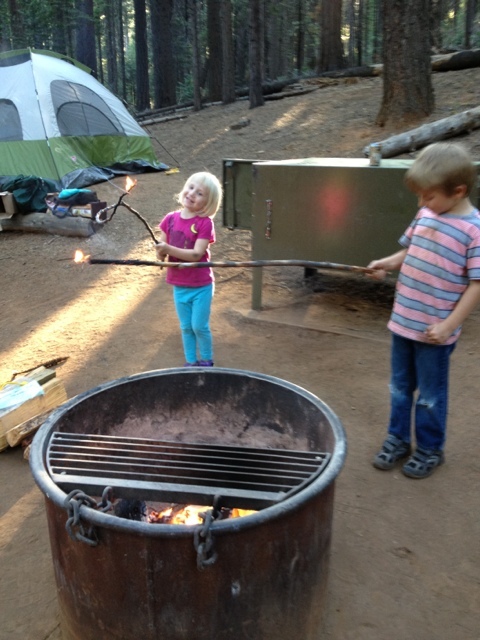 Fortunately, camping was so fun that the camping fun experiences dwarf the car mishaps in our memories. Caleb’s garage start-up is so engaging that at the start of the weekend he was really having trouble tearing himself away from his work. His mind was so occupied actually that he had trouble tearing himself away from the gas station as well. After we gassed up for the road and drove away there was popping sound in the car. Turns out we had forgotten to take the gas pump out of the car. Doh. When the gas station attendant came to check out what had gone wrong Caleb explained, “I’ve never done this before … ” Fortunately there was no obvious damage to the gas station and we were on our way quickly in case there was any less obvious damage. We camped at a park called Big Trees. It was full of big pinecones. Actually it was full of *really* big trees, sequoias, the biggest trees in the world. 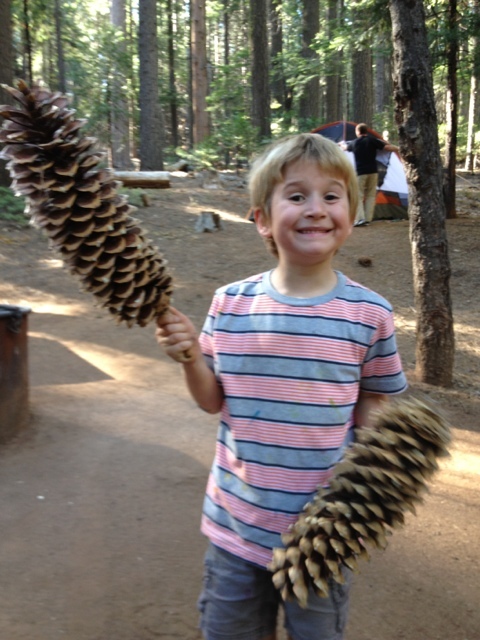 These big trees have pine cones about the size of Leo’s palm. It is the sugar pines, trees of an unremarkable size, that have pine cones about the size of Leo’s torso. Often in our day to day life Leo has his friends and Lucy has to be the tag along little sister. 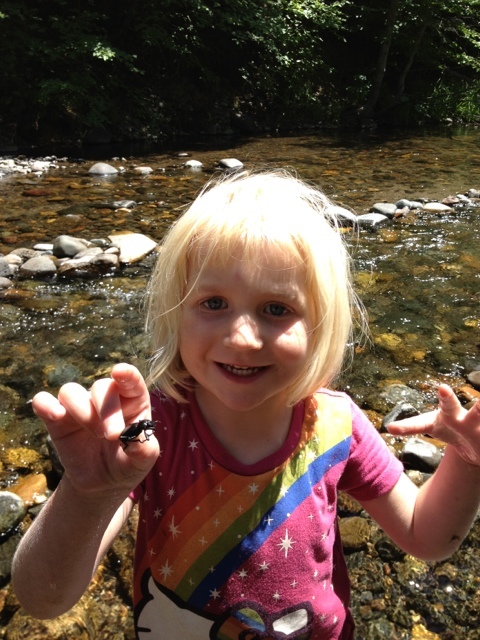 On this trip Lucy was lucky enough to have a little three year old friend, Beatrix. There were a few times that the girls ganged up on Leo. One time they even said “No boys allowed in the tent.” Leo was pretty upset by this incident but his earnest recount was quite funny. Since there are worse things to lie about than feigning interest in a pillow fight, Caleb and I decided to let this one go. There were also lots of times when everyone played nicely together. David came up with a safe and child friendly came called light sticks on fire. David also turns out to be a campfire Morimoto. 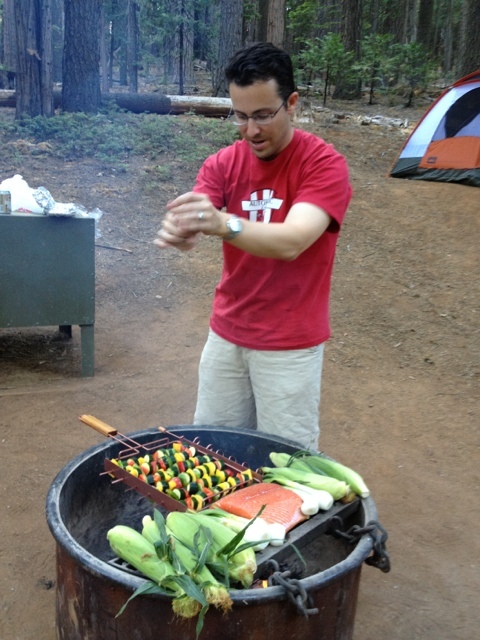 For our first dinner he roasted us a salmon on a cedar slab with corn and roasted veggies. This was the first time that I ever had grilled corn that tasted moist. Bravo David. But not to be outdone. 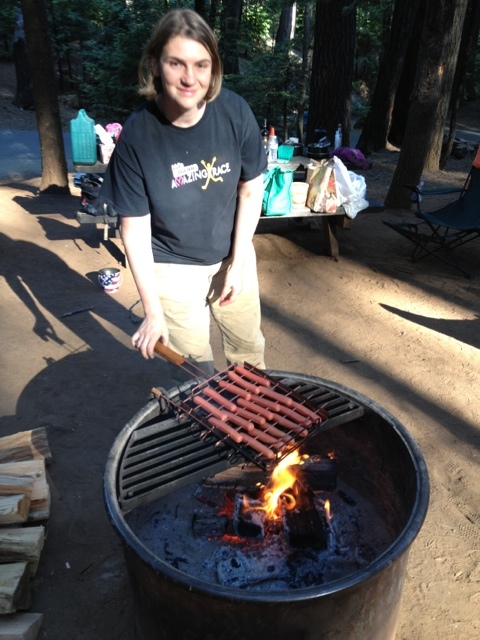 On the second night we engaged in battle hot dog. Now we had heard that there are bears in camp Big Trees. To prevent the bears from eating you there are a few precautions you need to take. 1) No food in the tent. And 2) Scare the bear away if you see them. So on the first night when tucking Lucy in after engaging in another car camping tradition, s’mores, I noticed that her hair was full of sticky marshmallows. Was marshmallows in the hair the same as food in the tent? Was a bad bear gonna come eat my little girl? I made sure to clean Lucy’s face and hair especially good with some wet paper towels. Fortunately, no bear came by for us to test out how potent marshmallow hair is or if yelling “bad bear” really is the way to scare away a bear. On our second day we took Leo to little rangers class at the vistor center. The class was all about bats. The whole family learned a lot about bats. We also learned how much we didn’t know. For example, did you know that bats are not really flying rodents? Or that when someone says “blind as a bat” they mean “blind as someone who can see”? That’s right, bats are not blind. Just because they prefer to rely heavily on echolocation it does not mean they cannot see. Also, did you know that you love bats because they eat mosquitos? Bats are mosquito eating mammals, not creepy flying rodents. They are really kind of like a big spider that is better to be put outside than to be stepped on. The one answer that I really nailed was when the teacher asked “how do bats sleep”? Upside down. Duh. After playing in the creek, hot dogs, and another night under the stars, like all good things, car camping too, had to come to an end. But not without another car moment. On our way home we heard a bump bump ba bump. We pulled over. Turns out we had a flat tire. Being the Internet manager kind of gal I am I pulled out my AAA card. Being the garage start-up kind of guy Caleb is, he pulled out his jack. Whose cuisine would reign supreme? In this case, chef AAA won on battlefield highway 4. 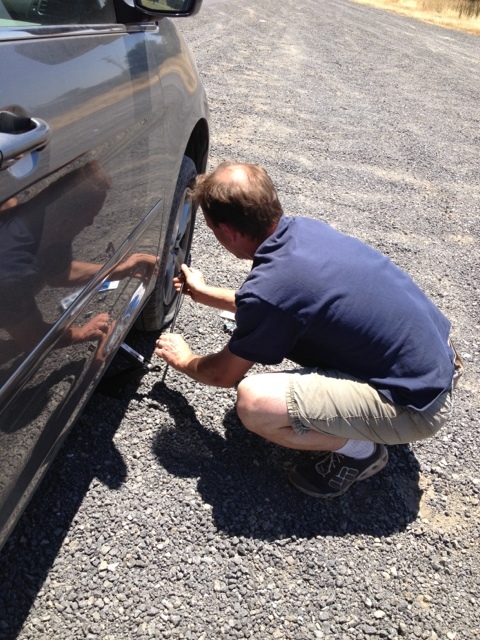 But before I get too haughty with my clear insight on how to change a tire (e.g. dial AAA) we shouldn’t forget the story of the lost wallet. Caleb gave me his wallet to call the AAA guys. And then hours later after the tire was changed and we were on the road and stopped for a drink, the wallet was gone. I lose a lot of things but it was hard to believe that the wallet was gone. So we kept on home. But then when we got home, Caleb’s wallet was still gone. I didn’t remember anything really, but it seemed so unlike me just to throw my husband’s wallet on the ground on a 90 degree gravelly turn-off. But, indeed, the wallet was gone. And even worse, I was the last one who had had it. We also lost the stakes to the tent we rented. At REI, my excuse was, well I lost my husband’s wallet. At which point the nice cashier at REI offered to not make me pay for the stakes. A good excuse to keep in mind, “you see, the thing I lost of yours is not as bad as the thing I lost of my own“. But where was the wallet? Boy, was Caleb seeming stressed. And I no longer felt like the smart wife that knew how to call AAA. So I took one more look in the car because sometimes the loser is the best finder. And phew, Caleb’s wallet was under Leo’s carseat. Yay. And to finish this post I want to both thank my friends, Yvette and David for such an awesome car camping weekend. Yvette and David rented the perfect spot. Were amazing company. Cooked an awesome meal. And let their daughter babysit our children. Thank you guys! Who could ask for more? I also want to thank my Honda Odyessey. Honda sweetie, you were big enough to tote two families around. Didn’t ruin the gas station that we forgot to unlock you from. And finally, you provided AC and movies when my children were stuck for 2 hrs in 90 degree heat on the side of the road. I cannot thank you enough. 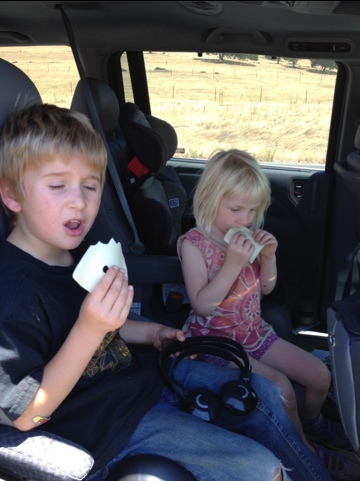 Here is the final picture of those children eating cheese slices in the 90 degree neat with their flat tire. Today we had a visit from Aunt Carol and Uncle Gary. Carol got down on the floor and helped the kids build some kind of animal castle zoo thing. This is the kind of game that starts out quite fun. But then 20-30 minutes in devovles into total chaos. In this case Leo was using a wooden mallet to bang on the animals and shout “you bad you not upside down.” Then eventually there were blocks everywhere and kids somewhere between crying and laughing hysterically and me setting a time out. That is pretty much how games start and end around here. You just cross your fingers that the calm part will last for a while. After dinner the kids went off to the side of the house to play. Leo announced that they had made me something. So he led me over with my eyes closed. Open your eyes. Look we wrote your name! We also picked all the beautiful pink flowers off the bush in order to do it but we wont mention that. Sometimes the line between thoughtful and thoughtless can be so fine. Aunt Carol is actually Caleb’s aunt and Gary is her husband. We were so happy to see them and glad they could finally meet our kids. So what is more intimidating three boys with guns or a really friendly blond three year old?